Please consider not buying any HONEYWELL products – such as stand or ceiling fans, dehumidifiers, air purifiers, etc. HONEYWELL is a war profiteer, making hundreds of millions on weapons, including the engine and other equipment for the MQ-9 Reaper drone, the world’s #1 killer drone. Making nuclear weapons, Fracking, Canadian tar sands mining for oil, The Keystone XL Pipeline, Making weapons for the Israeli Defense Force, The Trans-Pacific Partnership trade deal that will harm US workers, Attempts to cut Social Security and other benefit programs, Environmental contamination, Corporate Misconduct. Honeywell Profits from Drone Killing, War, & Political Bribery! Honeywell is NOT your friend! BOYCOTT HONEYWELL PRODUCTS TO PROTEST DRONES AND WAR. On Saturday, Oct. 4, from 10AM till noon anti-war picketers under the banner of Malu ‘Aina Center for Non-violent Education & Action will ask Home Depot and Walmart shoppers at the Hilo Maka’ala St. stores not to buy Honeywell consumer products such as fans, air purifiers, thermostats, dehumidifiers, etc. because Honeywell also makes engines for MQ-9 Reaper killer drones as well as other war materiel, including nuclear weapons. Home Depot and Wal-Mart store carries Honeywell stand and ceiling fans, air purifiers, thermostats, humidifiers, and other products. The Hilo action will be in solidarity with similar demonstrations across the country targeting Honeywell International for its war profiteering activities and asking consumers and retailers like Wal-Mart, Home Depot, Target, Amazon and Apple to sever their ties with Honeywell. Beside Hilo, Hawaii, actions are planned on and around Oct. 4 for New York, NY; Rochester, NY; White Plains N.Y. Coconut Creek, FL; the Twin Cities, MN; Columbia, SC; Boston, MA; and San Francisco, CA. This series of protests will inaugurate the long-term, nationwide BadHoneywell campaign. G4S supplies Israeli prisons with services and equipment including Ofer prison which holds Palestinian children under military detention often without charge for long periods. G4S is complicit in Palestinian child detention in Israel, war profiteering and bolstering the occupation of Palestine. It is on the Boycott, Divestment, and Sanction (BDS) list. Perhaps this office can be a stop on Oct. 25th in Hilo’s March for Palestine. Check out instamap at the bottom of the article below that lists G4S offices in north America and Hawaii. I am sharing an article by my daughter Kali (still living in Iraq) re-posted on CL with an action item. I hope everyone is doing well in spite of the despicable actions of our government. Thank you for continuing to work for change. Focus: Boycott Honeywell consumer products –thermostats, dehumidifiers, etc. Honeywell also makes the engine and navigational equipment for the killer drone –MQ-9 Reaper. Honeywell is not your friend. 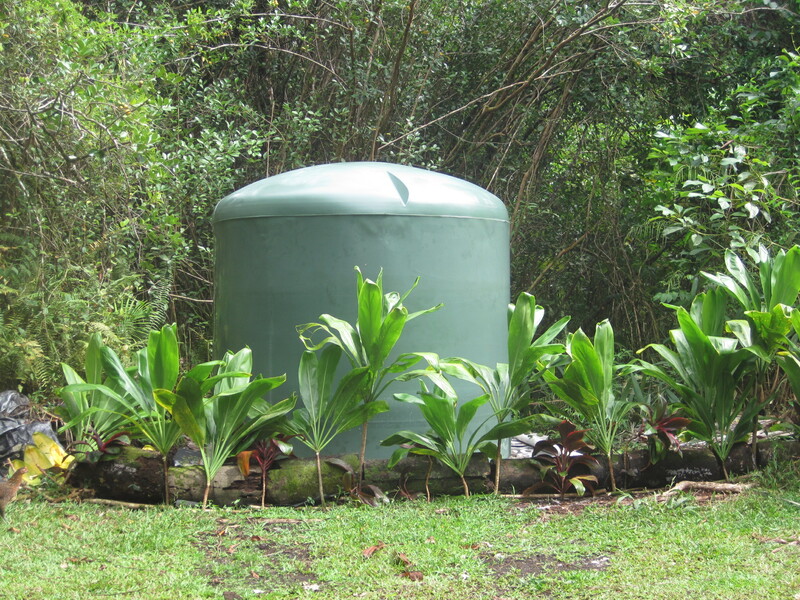 Hurricane/Tropical Storm Iselle downed two large ohia trees on our Malu ‘Aina main water catchment tank and broke all the pipes going in and out of the tank. It still holds some water so we ran new pipes in and out to make due. The storm damage here could have been much worse but it was bad enough. Just yesterday we finally got a new tank set up and gutters and pipe going in. Last night’s rain put about 600-800 gallons in the new tank so we are happy. Now we have the run a new line from the tank to connect to the house.